Chick-fil-A is also partnering with Sacred Hearts Community Service to host a food drive on April 2nd. For every five food items brought for the food pantry, guests will receive a coupon for a free Chick-fil-A entree. More info below in the press release. SAN JOSE, Calif. (April 3, 2014) – San Jose’s newest stand-alone Chick-fil-A® restaurant at 2280 Monterey Road will open April 3, bringing nearly 70 new jobs and the chance for 100 adults to win free Chick-fil-A meals for a year as the chain marks the 50th anniversary of its signature Chick-fil-A sandwich. 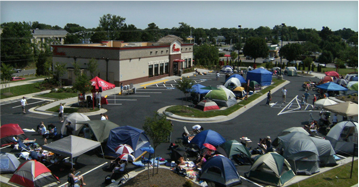 Chick-fil-A’s “First 100” event, which began as a way to celebrate the first stand-alone Chick-fil-A in Arizona in 2003, immediately became the cornerstone of every Chick-fil-A grand opening when the first person arrived more than 18 hours the day before, wondering where to get in line. Others soon followed and by the time the restaurant opened for business the next day, more than 100 were waiting. Humbled and surprised by the dedication of its fans, Chick-fil-A quickly implemented the “First 100” at every grand opening and in the past 10 years has given away almost $21 million in free food at more than 750 grand openings. The new San Jose restaurant will be the scene of the latest Chick-fil-A grand opening celebration. The first 100 adults, ages 18 and older with identification, in line when the doors open about 6 a.m. on Thursday, April 3, each will win a one-year supply of free Chick-fil-A® Meals (52 meals consisting of a Chick-fil-A Chicken Sandwich, medium Waffle Potato Fries™ and a medium drink) – a total of more than $30,000 in free food. The line officially opens at 6 a.m., Wednesday, April 2, with the free meal cards being awarded Thursday, April 3, around 6 a.m. The restaurant will open for business immediately thereafter. If there are more than 100 people by 6 a.m. on Wednesday, April 2, all 100 spots will be determined by a drawing held that morning with those selected needing to camp out to secure their spot. For complete rules, see Chick-fil-A First 100 Promotion. In conjunction with the First 100 celebration, the new San Jose Chick-fil-A is partnering with Sacred Heart Community Service to host a food drive at the new restaurant between 11 a.m. and 6 p.m., Wednesday, April 2. Chick-fil-A Owner/Operator Shannon Balderas will award a coupon for a free Chick-fil-A entrée for every five non-perishable food items donated. Sacred Heart provides essential services, empowers people to improve their lives, advocates for justice and inspires volunteers to love, serve and share. The new restaurant comes 30 years after Chick-fil-A first opened in California in a Cerritos mall in 1984. After 20 years of operating in several Southern California mall locations, Chick-fil-A opened its first two stand-alone restaurants 10 years ago in Chino Hills and Irvine in early 2004. The new restaurant on Monterey Road will be the second Chick-fil-A restaurant in San Jose, joining the first Bay Area stand-alone Chick-fil-A which opened on Headquarters Drive in 2012. The two are among 68 restaurants operating in California. The newest San Jose Chick-fil-A is the first of nine restaurants projected to open in California this year bringing nearly 600 new jobs to the state and is among 88 new locations the chain is opening nationwide this year, creating more than 6,700 new jobs overall. Chick-fil-A opened more restaurants than ever before in 2013 with 114 new locations added across the country. With a degree in kinesiology, Balderas graduated from the University of Texas and then pursued her Masters in social work at the University of Houston. After a career as a Houston Police Department lieutenant and District leader of security at Target, Balderas decided to pursue the dream of becoming a Chick-fil-A operator almost four years ago. A Santa Clara County resident, Balderas, her husband Rogelio and their family look forward to serving their community. The new restaurant seats 111 and has warm colors and wood accents. It offers the convenience of free Wi-Fi and features the chain’s latest interior and kitchen design. Additionally, customers will find that the chain’s dual drive-thru ordering point design helps to expand its award-winning drive-thru service. With a majority of customers at Chick-fil-A stand-alone restaurants choosing drive-thru, the ability for two drivers to simultaneously order should mean quicker service. Families can also enjoy the interactive play area. The restaurant is open Monday through Saturday from 6:30 a.m. to 10 p.m., serving a full breakfast menu until 10:30 a.m.
Chick-fil-A restaurant opened in 1967 and though many other selections have been added over the past five decades, it remains the centerpiece of the menu as the chain has grown to more than 1,803 restaurants in 39 states and Washington D.C.
Chick-fil-A continues to win industry accolades including Men’s Health “Eat This, Not That” 2013 edition which again gave the chain high marks (A-) and named it one of the top two restaurants providing healthier menu options. For more information on the San Jose Chick-fil-A restaurant visit on Facebook at Chick fil A Monterey & Tully. Atlanta-based Chick-fil-A, Inc. is a family owned and privately held restaurant company dedicated to serving the communities in which its restaurants operate. Credited with inventing the chicken sandwich, Chick-fil-A serves nutritious, freshly prepared food in 1,803 restaurants in 39 states and Washington, D.C. Weren't they suppose to open a location at SJ Market Center? What ever happened to that? With the opinions their ceo has with regard to gay people and gay rights, they won't get any of my money. Too bad we couldn't get a city ordinance b banning them from San Jose..too late now I guess. I wish people would just boycott it, but given the popularity of their first "restaurant" that seems unlikely. I eat there so hard working employees can continue to have jobs. The food is good - I don't care what the owner believes - its not my place to discriminate. It's not like the chicken makes you hate gay people. Food is food is food and money is crap. What's wrong with traditional Marriage ? Not only is the food good but I ate there today to support them with my money and so did a whole bunch of other people. That place was packed. It's just food, Neutrino :) Besides, the restaurant opening provides jobs for the poor folks, that's a good thing, we should support that. It's not just food. A Chick-fil-A executive living in Georgia uses the profits he receives from the company to influence California politics. I don't think providing jobs means a community has to accept the owners political causes. Other restaurants or jobs can open in the areas these things are taking up. There is no need these places need to compete with good restaurants in San Jose. Tweet from SF Mayor Ed Lee: "Closest #ChickFilA to San Francisco is 40 miles away & I strongly recommend that they not try to come any closer." "Oho!" said the pot to the kettle! By the same token, shouldn't then @mayoredlee call for the closure of that Russian consulate in San Francisco? I like it! I wish San Jose's mayor would do the same thing. It's disappointing to see this blog promoting a business that has few ties to the community. Were you paid to promote this business? This is a slap in the face to the gay community and local businesses. Please consider removing this post. No I was not paid to promote them. A lot of San Joseans like Chick-fil-A. For better or worse, the most popular post ever on this site was the launch of the first Chick-fil-A in San Jose. I have to admit that I really do like their chicken sandwiches, and by the way I am very much pro gay in my political views. If the owner of the chain wants to throw his money down the toilet to support campaigns that will clearly fail, that is his decision. Everything seems to be tied, but I don't know the numbers specifically, some amount of money spent on the chicken sandwiches goes as profits to the founder. Of that amount, and clearly if he makes more money he will spend more on this. But of the amount spent, he gives some to FRC, which did spend $25k to prevent Congress from condemning Uguda on its "kill the gays" bill. I wouldn't be surprised if he donates money to churches that send missionaries to Uganda to spread their message of hate. Either way while I don't think we shouldn't mention it, I find it bad that you mention nothing of the controversy, this is a company that doesn't seem to have the same values as most of San Jose, and I think readers would want to know about the controversy. Jorge, I think we all very well aware of Chick-Fil-A's controversy :) For the ones who aren't aware, they most likely aren't going to give two sh*t about eating or not eating at Chick-Fil-A. The comments on your other three Chick-fil-A posts are largely similar to the ones on this post. The popularity of the other posts is probably due to the insensitivity of promoting a business linked to anti-gay causes, rather than excitement over the business. You may be pro-gay, but no mention of the controversy in four posts is an implicit endorsement of executive's anti-gay agenda. How about a title like "Chick-fil-A Opens 2nd San Jose Location, Despite Political Controversy?" It acknowledges both the Chick-fil-A fans and the portion of the community that doesn't want businesses linked to anti-gay groups in San Jose. It is not an implicit endorsement of an anti-gay agenda... in fact a post here is not even an endorsement of the restaurant itself. A second Chick-fil-A opened in San Jose, get over it. Side-note I have a family member that is gay and loves eating there and she's fully aware of the controversy. No good deed goes unpunished Josh. That's all I can say. I'm gay and I love their food. I know gay people that work there. The CEO has a personal opinion that's different to mine. So be it! Aren't we all glad that we live in a country where it's OK to have different opinions? Quit trying to make this about gay people. As a gay person, I can say I don't care what the owner believes. His beliefs have no effect on my personal life. I'll continue to eat wherever I please. Damn bleeding hearts. I very much respect the gay persons answer. Instead of doing this food drive at Chick-fil-A, readers should consider directly donating food, or even better money to the Second Harvest Food Bank http://www.shfb.org/, Second Harvest not only directly gives food to people in need, it works with shelters and kitchens for the poor to feed the poor in Silicon Valley. There is no need that readers should feel like they need to mix helping people with hurting gay people here and abroad. I'm gay. Chick-fil-A is disgusting, factory made food run by a loser CEO. And this is not news. Boo! So, how do you like the food? If anyone (from either side) would care to not spew vitriol, I'm genuinely curious as to how one fast-food restaurant can create *seventy* jobs. Anyone? I love Curry Up Now! I used to go to their San Mateo restaurant all the time (when I used to have time to go out and grab lunch). That will be a solid addition to Crescent Village. it seems to me that a lot of people don't remember that California Voted Yes on 8 . So it's not a surprise that people support Chick fil A...The Homosexual lifestyle has always been a shameful thing and still is. Wow, saying that today is analagous to saying segregation was okay 60 years ago. 8 would never pass today and there was a reason why it was striked down as unconstitutional. At some point in your life you will likely regret making that comment. Why didn't anybody holler unconstitutional before the vote. Keep it real Josh. There's a reason why it was in the closet in the first place. There is no point at looking at the past as we have made a series of decisions that have turned out to be huge mistakes in the past as a society. Prop 8 passing the first time will go down as one of those moments not to be proud of. Where's that infamous san jose arsonist when you need him? I totally agree with their stand on gay marriage, but that aside, they have the best sandwiches in existence. The wacko comments from people who disagree with the owner's cultural position are missing a good eating experience.